Plain carbon steels, if used for cutting tools, lack certain characteristics necessary for high-speed production, such as red-hardness (resistance to heat softening). The effect of alloying elements in steel is of great advantage and yields tool steels that overcome many of the shortcomings of the plain carbon steels. Information about tool steels and its method of classification as per AISI is given in this article. Tool steels are defined by U.S. steel producers as “carbon or alloy steels capable of being hardened and tempered”. Many alloy steels would fit this loose definition. However tool steels usually contain significantly more alloying elements than alloy steels. Approximately 70 types of tool steels are available in the United States. One reason for so many types of tool steels is evolutionary development over a period of many years. The second reason is the wide range of needs that they serve. Tool steels have properties that permit their use as tools for cutting and shaping metals and other materials both hot and cold. One problem that exists in discussing the metallurgy of tool steels is that, since there are seven major headings, it is difficult to make statements that apply to all these steels. The following are some of the characteristics of tool steels. Composition and physical properties vary significantly (some tool steels have compositions that fit into the composition ranges of carbon and alloy steels, but most tool steels have alloy concentrations that are significantly higher than the carbon and alloy steels). One important factor that should be kept in mind is that the alloy additions do not improve corrosion resistance even though some grades have as much chromium as stainless steels. The reason for this is that alloy elements are usually combined with carbon to form carbides. The most significant metallurgical difference between tool steels and the other steels is their microstructure. A fully hardened carbon steel or alloy steel would have only martensite as the predominant phase. Most tool steels have a hardened structure of martensite and alloy carbides. Require special heat treatment processes. Better hardenability than most carbon and alloy steels. Most tool steels are sold as hot-finished shapes such as rounds and bars. Designation system of one-letter in combination with a number is adopted for classification of tool steels by American Iron and Steel Institute (AISI). The commonly used tool steels have been grouped into seven major headings, and each group or subgroup has been assigned an alphabetical letter as under. The term toughness as applied to tool steels may be thought of as the ability to resist breaking rather than the ability to absorb energy during deformation. They are used for low speeds and light cuts on relatively soft materials such as wood, brass, aluminium and unhardened low carbon steels. Essentially these are plain carbon steels with 0.60 to 1.40 % carbon. They have soft core (for toughness) with hard shallow layer (for wear resistance). Their resistance to heat is poor. These steels are low in carbon content (0.45 to 0.55 %). The principal alloying elements are silicon, chromium, tungsten and sometimes molybdenum. Silicon strengthens the ferrite, while chromium increases hardenability and contributes slightly to wear resistance. Tungsten imparts red-hardness. The S group of tool steels were originally developed to withstand repeated shock (chisel-type applications), but the number of alloys in this category has evolved to include steels with a broad range of tool applications. This class of steels has a very good shock resistant quality with excellent toughness. They are used in forming tools, chisels, punches, cutting blades and pneumatic tools. Cold work tool steels are used for taps; blanking, forming and thread rolling dies; knurling tools; reamers; master gauges and drawing dies for wire, bars and tubes. 0.90 to 1.45 % Carbon with Mn, Si, W, Mo, Cr. They contain graphite in the hardened structure along with martensite. (Graphite acts as a lubricator and also makes machining easier). Contain 5 to 10 % alloying elements (Mn, Si, W, Mo, Cr, V, Ni) to improve the hardenability, wear resistance and toughness. Contain 12% Cr and up to 2.25 % C.
Low distortion, high abrasion resistance. In many applications the tool is subjected to excessive heat because the material being worked is in hot condition. Tool steels developed for these applications are known as hot work tool steels and have good red-hardness. They are categorized by major alloying elements into three subgroups as under. These steels are used in hot die work of all kinds, particularly extrusion dies, forging dies, die-casting dies, hot shear blades and mandrels. The major application of high-speed steels is for cutting tools, but they are also used for making extrusion dies, blanking punches and dies. These are the classes of steel that deep harden, retain that hardness at elevated temperatures and have high resistance to wear and abrasion. The carbon content of these steels varies from 0.70 % to 1.50 %. These steels are subdivided into two groups: molybdenum base (group M) and tungsten base (group T). From the stand point of fabrication and tool performance, there is little difference between the molybdenum and tungsten grades. The important properties of red-hardness, wear resistance and toughness are about the same. This class of tool material has a substantial amount of wear-resistant carbides in a hard heat resistant matrix. These steels are used in machine cutting tools such as tool bits, milling cutters, taps, reamers, drills, broaches. 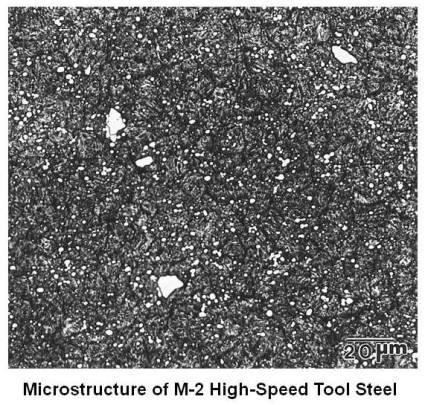 The microstructure of a typical AISI M-2 high-speed tool steel is shown in the figure given below. The microstructure consists of tempered martensite and carbides (white etching constituent). These steels have 0.10 to 0.35 % carbon. They show high toughness. The low carbon mold steels cannot be quench hardened. The carbon and alloy content is low to allow hubbing of mold details. The desired mold shape is pressed into the steel with a hub that is usually made from high speed steel. Thus mold cavities can be made without machining. Hubbed cavities are then carburized to make a production injection molding cavity. They are used for low-temperature die casting dies and for molds for injection or compression molding of plastics. Many tool steels do not fall into the usual categories and are therefore designated as special-purpose tool steels. The oil-hardening L group steels are low alloy steels with about 1 % Cr that makes them a good low cost substitute for cold work steels. The carbon-tungsten type (F group) steels are generally shallow-hardening, water-quenching steels with high carbon and tungsten content to promote high wear resistance. They are relatively brittle, so that in general they are used for high-wear, low-temperature and low-shock applications. Typical uses for the L group steels are various machine tool applications where high wear resistance with good toughness is required as used in bearings, rollers, clutch plates, cams, etc. The high carbon types are used for gages, drills, taps, threading dies, knurls, etc. The F group steels are used in wire-drawing dies, plug gages, forming tools, knives, etc. Following materials are also used for tools. These are essentially cobalt-chromium-tungsten alloys. They contain from 25 to 35 percent chromium, 4 to 25 percent tungsten, 1 to 3 percent carbon and the remainder cobalt. The hardness of stellite varies from C 40 to 60, depending upon the tungsten and carbon content. Their outstanding properties are high hardness, high resistance to wear and corrosion and excellent red-hardness. Stellite metal-cutting tool are widely used for machining steel, cast iron, cast steel, stainless steel and most machinable materials. They may be operated at higher speeds than those used with high-speed-steel tools. Stellite is also used as a hard-facing material. These materials are made of very finely divided carbide particles of the refractory metals, cemented together by a metal or alloy of the iron group, forming a body of very high hardness and high compressive strength. Cemented carbides are manufactured by powder-metallurgy techniques. The exceptional tool performance of sintered carbide results from high hardness and high compressive strength combined with unusual red-hardness. The lowest hardness of sintered carbide is approximately the same as the highest hardness available in tool steel, Rockwell C 67. Since cemented carbides have low toughness and tensile strength, the usual practice is to braze or mechanically fasten a small piece of carbide material (called an insert) to a steel shank, which provides rigid support under the cutting edge. The high hardness and wear resistance make them well suited for earth drilling and mining applications. Cemented carbide dies are used for the hot drawing of tungsten and molybdenum and for the cold drawing of wire, bar and tubing made of steel, copper and other materials. Most ceramic or cemented oxide cutting tools are manufactured primarily from aluminium oxide. Ceramic cutting tools are most commonly made as a disposable insert which is fastened in a mechanical holder. The principal elevated-temperature properties of alumina are high hardness, chemical inertness and resistance to wear. They are used in machining cast iron and hardened steel at high cutting speeds. They withstand the abrasion of sand and of inclusions found in castings. Heat treated materials as hard as Rockwell C 66 can be readily machined by them. However they are brittle and tend to chip easily. For most applications, hardness, toughness, wear resistance and red-hardness are the most important selection factors in choosing tools steels. The selection of proper tool steel for a give application is a difficult task. Although many tool steels will perform on any given job, they will have to be judged on the basis of expected productivity, ease of fabrication and cost. In the final analysis, it is the cost per unit part made by the tool that determines the proper selection.